President Trump and his team of trade and finance advisers had dinner with President Xi Jinping of China and his team. The purpose was to discuss the ongoing trade war between China and the U.S. Trump’s team had presented the Chinese team with 142 specific trade demands. The two sides went over the demands one by one during the course of their two-hour dinner. When they were done, both sides announced a 90-day “truce” in the trade wars. China agreed to negotiate in good faith on the demands and the U.S. agreed to delay the imposition of tariffs scheduled to go into effect Jan. 1, 2019, until March 1, 2019, to give the negotiations time to proceed. This was not a final deal, but it did allow markets to breathe a sigh of relief. The initial response of the stock market was a rally. But just hours after the Trump-Xi announcements, Canada arrested Meng Wanzhou, the CFO of Huawei, in Vancouver, British Columbia. The arrest was at the request of the United States, which had issued an arrest warrant for Meng last August on numerous charges including money laundering, espionage and selling telecommunications equipment to Iran in violation of U.S. sanctions. Meng was arrested during a stopover in Vancouver on a flight from China to Mexico. She was avoiding U.S. territory but was apparently unaware of the U.S. arrest warrant and the degree of cooperation between Canada and the U.S. on criminal matters and extradition.Huawei is the largest telecommunications equipment manufacturer in the world and one of the largest tech companies in China. Meng is the daughter of Huawei founder Ren Zhengfei. The arrest of Meng threw global markets into turmoil. The Dow Jones industrial average index fell over 1,400 points, a 5.5% swoon, from the close on Monday, Dec. 3 to the close on Friday, Dec. 7. As of the Friday close, the Dow was down for the month, quarter and year. By the way, as of today, Dec. 13, it’s still down on the year. By Sunday, Dec. 9, Canada was asking that Meng remain in jail pending the outcome of a hearing on whether she should be extradited to the U.S. to face a criminal trial. Meng’s lawyers were arguing that she should be granted bail and was not a flight risk because she owned property in Vancouver. She also argued that her health would be adversely affected by further incarceration. The Canadian court took these claims under advisement and planned to rule soon on the bail and extradition. The Huawei arrest was more than a shock to markets. It was also a shock to the U.S.-China trade war negotiations. Both sides pledged to keep the negotiations on track, but China was publicly outraged by the arrest. The Meng arrest is significant in its own right, but is even more significant when taken in the full context of U.S.–China relations and the possibility of a new Cold War. Huawei is not only China’s largest telecommunications firm; it is a leader in the rollout of 5G technology for mobile phones. Huawei is alleged to have deep ties to the Communist Chinese government and the People’s Liberation Army (PLA). Huawei founder Ren Zhengfei started his career as a military technologist at the People’s Liberation Army research institute. U.S. intelligence estimates that Huawei is de facto controlled by PLA and has engineered trapdoors and other devices in Huawei equipment that allow Huawei to spy on customer message traffic and to capture private data. The U.S. has already refused to allow Huawei to make acquisitions of U.S. companies and has banned Huawei from sales of equipment to the U.S. government. The U.S. has also urged its intelligence partners in the “Five Eyes” (U.K., Canada, Australia and New Zealand) to do likewise. Huawei’s business is suffering worldwide just as the 5G tech implementation begins. The next steps in the case are still pending. The British Columbia court needs to decide on bail and possible extradition. If Canada extradites Meng to the U.S., she will almost certainly face a trial on criminal charges unless a plea deal can be worked out. In a worst case, Meng will spend years in a U.S. prison. At best, the case will inflict major damage on U.S.-China relations and the prospects for peace in the trade wars. In the meantime, the 90-day “truce” that Trump and Xi negotiated in Buenos Aires is still officially in force. The Chinese could offer token concessions and use the 90-day window to cook up new happy talk. Their hope will be that after 90 days of negotiations and some minor concessions, the U.S. will be reluctant to break the peace or impose the additional tariffs. The 90-day period will also give the Chinese lobbyists time to gin up opposition to tariffs from U.S. agricultural importers. This is an important political constituency for Trump as we move closer to the 2020 presidential election season. Trump needs support from agricultural states like Missouri, Iowa and Wisconsin to win his second term as president. It seems the Chinese understand U.S. politics better than most Americans. The Chinese are also notorious for saying one thing and doing another. They will gladly sign an agreement that calls for reductions in the theft of intellectual property and then turn around and keep up the thefts (perhaps with a more covert method). The Chinese have consistently broken their word when it comes to trade, beginning with their admission to the World Trade Organization in 2001. They will do it again once they tie the U.S.’ hands on tariffs. The good news for the U.S. is that the Chinese tricks are fairly well-known by now. Trump’s most trusted and powerful adviser on trade is ambassador Robert Lighthizer, who was at the dinner. Lighthizer sees the Chinese for what they are and knows the litany of broken promises and lies better than the Chinese leadership. If substantive improvements with adequate verification cannot be agreed upon with the Chinese by April 1, 2019, Lighthizer is ready to immediately raise tariffs on China. President Trump agrees with Lighthizer and will not hesitate to raise the tariffs. At that point, the trade wars will be back with a vengeance. This interpretation is backed up by the Fed’s past use of verbal cues to signal ease or tightening in lieu of actual rate hikes or cuts. Prior to March 2015, the Fed consistently used the word “patient” in their FOMC statements. In March 2015, Yellen removed the word “patient” from the statement. In fact, the first rate hike (the “liftoff”) did not happen until December 2015, but the market was on notice through the June and September 2015 FOMC meetings that it could happen. Now, for the first time since 2015, the word “patient” is back in the Fed’s statements, which means no future Fed rate hikes without fair warning. For now, the Fed is rescuing markets with a risk-on signal. That's why the market rallied last Friday. But we're not out of the woods by any means. The U.S. stock market had already anticipated the Fed would not raise rates in March. Friday’s statement by Powell confirms that, but this verbal ease is already priced in. As usual, the markets will want some ice cream to go with the big piece of cake they just got from Powell. The next FOMC meeting is Jan. 30. If the Fed does not repeat the word “patient,” markets could be in for an extremely negative reaction. Looking ahead to rest of 2019, what are my models and methods telling us today about the prospects for the economy and markets? The answer to that question requires an overview of many markets and sovereign economies around the world. While forecasts for China, the U.S. and Europe may differ in many particulars, what they have in common is interconnectedness. For example, a slowdown in China due to excessive debt and trade wars can reduce exports from Europe. In turn, reduced European exports can slow down European purchases of raw materials and other inputs and lead to a weaker euro. The weaker euro can translate into a stronger dollar, which causes disinflation in the U.S. That disinflation can increase the real value of debt burdens in the U.S. if nominal growth is lower than the increase in the nominal deficit. In other words, what happens in China does not stay in China. The world is densely connected. Any sound analysis must consider the ripples spreading out from any one factor. We need to look at the synchronized global slowdown, the Fed’s misguided policies, currency wars, trade wars and political dysfunction in the U.S. to arrive at conclusions and forecasts for the U.S. and beyond. All this takes place against a backdrop of mounting global debt. According to the Institute of International Finance (IIF), it required a record $8 trillion of freshly created debt to create just $1.3 trillion of global GDP. The trend is clear. The massive debts intended to achieve growth are piling on every day. Meanwhile, many of the debts taken on since 2009 are still on the books. This is a crisis waiting to happen. The combination of slow or negative growth and unprecedented debt is a recipe for a new debt crisis, which could easily slide into another global financial crisis. The Fed will have to pivot back to loosening, including a possible reintroduction of quantitative easing. But by then, it may be too late. Below, I show you why the economic head winds are getting stronger as we begin 2019. What can you do to prepare? Read on. Investors should play it safe and stay away from publicly-traded stocks that have more room to fall further, warns Jim Rickards, chief global strategist at West Shore Funds. Jim Rickards, author of The Road to Ruin, joins Remy Blaire at the NASDAQ MarketSite following the December FOMC rate announcement to discuss the trajectory of the Federal Reserve. 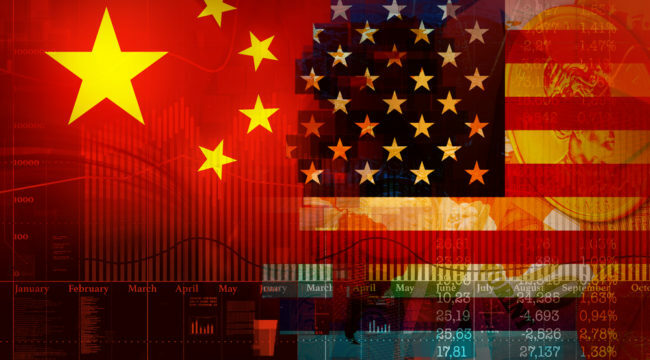 Rickards weighs in on the U.S.-China trade war and the fundamental outlook for the global investment landscape. James G. Rickards, author and strategist, joins Remy Blaire of Sprott Media, to discuss gold and why "the little engine that could" will do more than chug higher when the Federal Reserve pauses. Rickards provides an explanation for why growth can occur during a depression and the warning signs that he considers point to an eventual recession in the U.S. economy.